As soon as you throw around a tagline that says "ex-members of Blocko" I'm going to sit up and take notice right away. Blocko was one of my favorite UK punk rock bands and to see any of their members moving on to new projects is a wonderful thing. Bear Trade has been on my radar for a bit, since they released their debut 7" last year. Expectations were quite high for this full length, but I can say without question that Blood And Sand delivers. Being able to listen to a full album's worth of material from Bear Trade is kind of eye opening. I was expecting an album of Blocko style, dynamic palm muted glory. While there are songs that fit that bill, the rest of the album runs the gamut from Iron Chic style anthemic, "whoa-ohhh" fist raising songs to aggressive, but still catchy, burners like "Nice Boots." Also, a real stand out track is "Postcards." It's a song that could only emanate from the UK with it's soft spoken, almost storyteller like vocals that makes me feel like I'm hanging out with old timers telling stories in a run down pub. It's just an incredibly dynamic track and one of the best of an awfully great batch of songs. 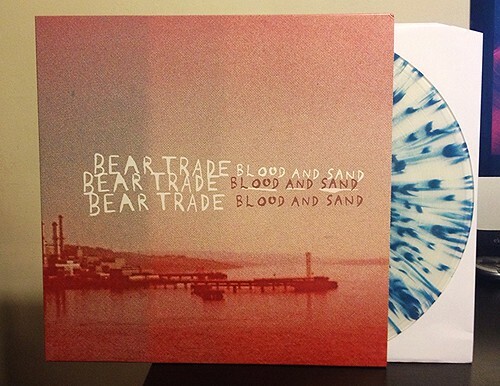 Needless to say, I'm thrilled with the debut full length from Bear Trade. Despite my high hopes for the record, they still managed to impress me. Back in the mid 90's, the UK punk scene was the most exciting scene on the planet. While those glory days may be behind us, with bands like Bear Trade, The No Marks and Stay Clean Jolene leading the way, the future is looking quite stellar. Friends Of Cesar Romero - The Hold 7"